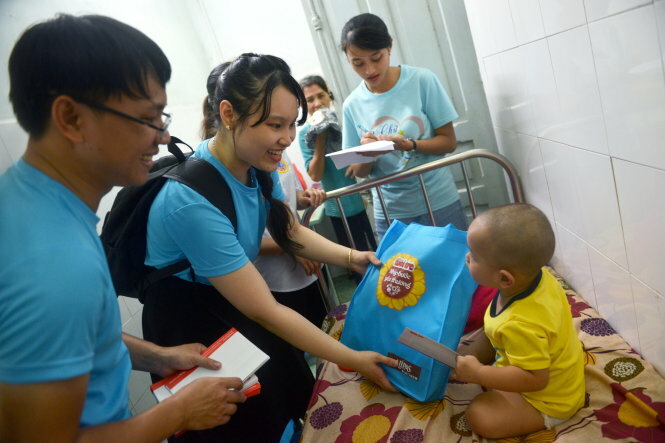 A charity activity in a Tuoi Tre (Youth) newspaper-backed annual fundraising event for children with cancer has visited and presented gifts to the little patients at three different hospitals in Ho Chi Minh City. As part of this year’s Sunflower Festival, the “Thuy’s Dream Foundation” brought more than 400 presents to little children with cancer who are receiving treatment at the Children Hospital 2 and the Blood Transfusion Hematology Hospital in District 1, and the Ho Chi Minh City Oncological Hospital in Binh Thanh District on Friday. The Sunflower Festival, which is annually held by Tuoi Tre to commemorate the death of Le Thanh Thuy – a high school girl known and admired for her long fight against bone cancer prior to her death on November 2, 2007, is now in its 11th edition. Each of the presents handed by the “Thuy’s Dream Foundation” consisted of a cash amount of VND500,000 (US$21.5) and other mementoes, including a T-shirt, a hat, a backpack and a notebook. A majority of the little patients here are in chemotherapy stages so their daily activities are very limited. But they were all smiling when receiving the gifts. Vu Quoc A., a six-year-old patient in room No.303 at the Blood Transfusion Hematology Hospital, immediately stopped his afternoon snack and cheered in joy when he received his bag of presents. “Mommy mommy, it’s a backpack,” A. told his mother while opening the gift. Meanwhile, another activity in the 2018 Sunflower Festival, the “Toi dong hanh” – literally translated as “I accompany” – campaign is also about to draw its curtain on December 2. The campaign raises financial support from a sponsor by calling people to draw or make paper sunflowers with messages of wishes for children with cancer written on the works, before uploading the photos of them on Facebook with the hashtags #ngayhoihoahuongduong2018 and #uocnguyenhong2018 and tagging three Facebook friends. Each of these entries will mean VND30,000 (US$1.3) in support for children with cancer. As of the end of Friday, nearly 4,500 flowers were drawn in response to the campaign. And to continue the success of the event in Hanoi on November 25, the opening ceremony of the 11th Sunflower Festival in Ho Chi Minh City will take place at Dam Sen Cultural Park in District 11 from 7:00-11:00 am this Sunday, with a variety of activities including a charity walk that has been registered by more than 3,000 participants.